PLEASE NOTE: Due to a fire in the warehouse in summer of 2017 many of the moulds were damaged or destroyed. Some are being replaced but others not. 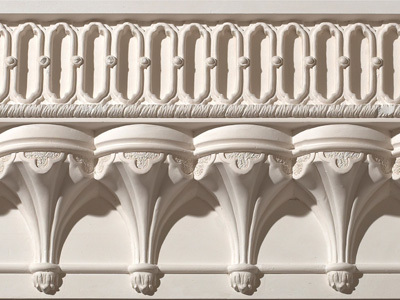 Please contact us to discuss which moulding you want to see if we can still supply it. Only the 1st four cornice mouldings below are affected. Victorian Gothic Small, Ref CC27. Now DISCONTINUED (due to a fire in the warehouse) Length 1.5M, projection 5cm x ht 10cm. Minimum order 6 pieces. Victorian Gothic, Ref CC26. Now DISCONTINUED (due to a fire in the warehouse) Length 3M, projection 11cm x ht 17cm. Minimum order 4 pieces. 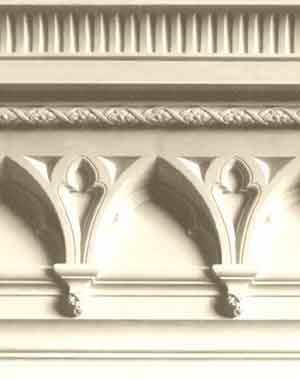 Gothic Cornice Ref ; 'Hardwick' TC419 Now DISCONTINUED (due to a fire in the warehouse). A good deep Gothic arcaded cornice. 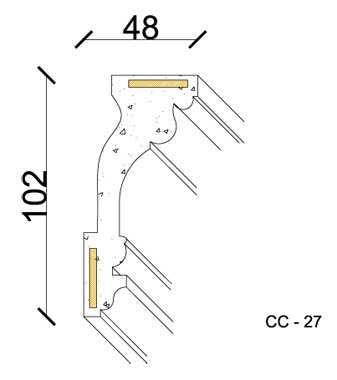 In lengths of 3.2M x ht200mmm x w110mm. Minimum order 4 lengths. Contact us for a quote. Shown below in a customer's house. 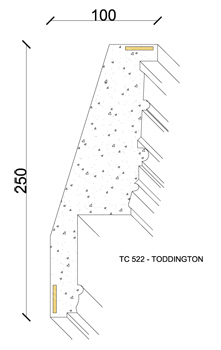 3/ Ornate Gothic Frieze 'Toddington' Ref TC522 - Now DISCONTINUED (due to a fire in the warehouse). This is a sumptuous large Gothic cornice - deep and richly moulded, with half boss pendants running along the wall. This would look magnificent in any room. Length 3.2M, ht 250mm x w 100mm. Minimum order 4 pieces. This is a very ornate larger moulding, it packs a real visual punch to an interior. Size -460 x 280mm. 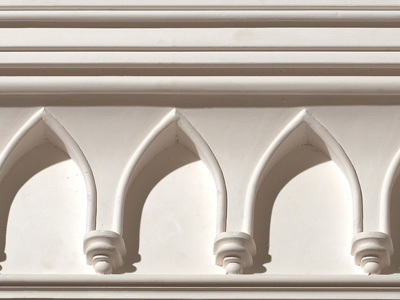 This is a fairly simple design Gothic cornice moulding, suitable for a light Gothic or Georgian Gothic look. Sizes to follow. 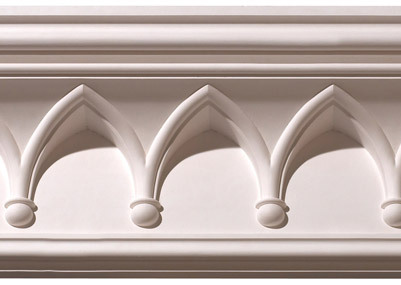 This is a good mid size Gothic cornice moulding, with good depth of detail. Suitable for medium - small size rooms. 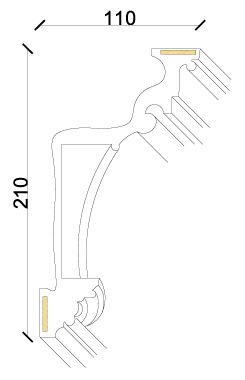 Height 130mm x D 90mm, Length 3M. Made to order. Minimum length order applies. Email us for quotes, delivery times, quanties, advice, etc. 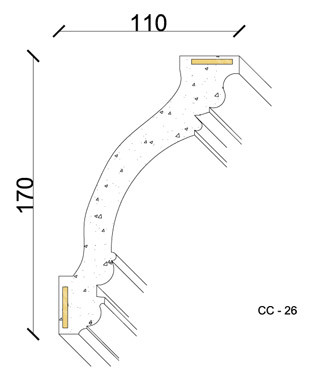 Cross-section drawings for cornice mouldings are shown. If you can't find what you are looking for, we may be able to source it for you anyway. See the Arts & Crafts & Art Deco plaster sections for further plaster mouldings. Pay particular attention to the scale of your room you want to add the mouldings to, the rule of thumb is the bigger the room the bigger the moulding it can take. We would probably recommend speaking to your builder or plaster installation company before ordering any mouldings. They can advise you accurately on the number of lengths you need, number of joins in runs there will be, how much extra to allow for corner joints, wasteage,etc. It is wise to add 10% - 15% to your order for extras. Usually it is supply only (reason being most customers fitting new plaster mouldings, & the mess that goes with that, are usually doing this as part of larger works. Please bear in mind a minimum quantity of any one moulding needs to be ordered, to make it worthwhile setting up & for delivery. Min. orders are often around 6 pieces, depending on the moulding; we'll let you know when quoting for a moulding. Bear in mind it may take 4+ weeks to make an order. It gets booked in, but these mouldings need time to dry out thoroughly, both for delivery and installation purposes.